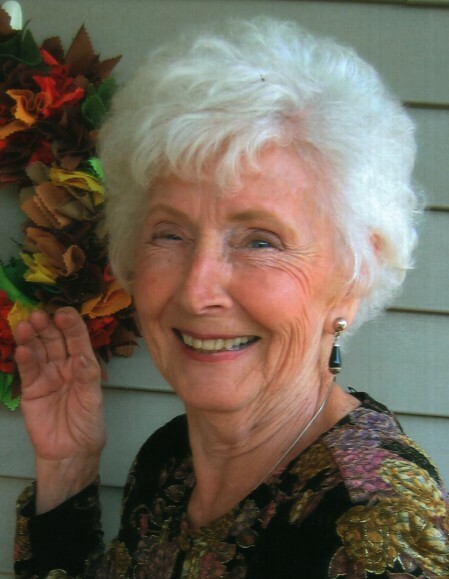 Marie Frances (Brueggemann) Wood was born on May 22, 1921, in Balsam Lake, WI, to Carl and Mary (Grundhoefer) Brueggemann. As a young girl, the family moved to St. Paul where she attended Elementary School at St. Francis de Sales Catholic School. She graduated from Mechanic Arts High School in St. Paul. On June 21, 1941, Marie was united in marriage to Joseph Wood at St. Francis de Sales Catholic Church. The couple first lived in St. Paul, then moved to Little Canada from 1950-1959 and later returned to St. Paul, living near St. Francis de Sales Catholic Church. In 1973, the couple moved to Brandon, MN having purchased Westwood Beach Resort on Big Chippewa Lake. They operated the resort until 1983. The family has many great memories of spending time at the resort visiting, swimming, fishing and having “pow wows” with “Gramma Cootie and Papa Joe”. After their retirement, Joe and Marie enjoyed spending their winters in Mission, TX where they loved visits from family and friends. Eventually, Marie moved to the Evansville Care Center where she lived comfortably in their devoted care until her death. Joe and Marie were blessed with 9 children each of whom they loved dearly. Marie enjoyed managing the household and taking care of their children. Her hands were never idle. She was a great baker; known especially for her pies, sticky biscuits and date bit cupcakes. She also enjoyed painting and making crafts. She was a wonderful seamstress - making quilts, pajamas, bibs and costumes for her children and many grandchildren. Marie was very involved with her church. Her faith was of the upmost importance to her and she loved to share her beliefs with her family. Marie died on Thursday, October 25, 2018, at the age of 97 at the Evansville Care Campus in Evansville, MN. Marie is survived by her children, Joanne (Douglas) Cunnien of Oakdale, Robert (Delores) Wood of Mahtomedi, Joseph (Marlene) Wood of Elbow Lake, Steve (Linda) Wood of Oakdale, Barbara (Timothy) Swanberg of Detroit Lakes, Raymond (Diane) Wood of Brandon and Peter (Debbie) Wood of Brandon; 37 grandchildren, 73 great-grandchildren and 6 great-great-grandchildren; and many nieces and nephews. Marie is preceded in death by her husband, Joseph; daughter, Susanne Hanson; infant son, Martin Wood; parents, Carl and Mary; brothers and sisters, Cyril Brueggemann, Luella Baker, Walter Brueggemann, Viola Slipka, Margaret McSherry, Catherine Tyler and Rosie Pinski. A visitation will be held 4 - 6 PM on Sunday, October 28, 2018, with parish prayers at 5:30 PM and a rosary to follow at St. Ann’s Catholic Church in Brandon. A Mass of Christian Burial will be held 11:00 AM on Monday, October 29, 2018, at St. Francis de Sales Catholic Church (650 Palace Ave. St. Paul, MN 55102) with a visitation 1 hr prior to the service at the church. Inurnment will be held at Resurrection Cemetery in Mendota Heights.